It is planned that in 2018 the employees of Novarka, the construction company from France, will finish their piece of work inside of the new sarcophagus. A new shelter weighing 36, 000 tons was placed over the damaged power unit in November. For the time being, Novarka employees keep on working. An American nuclear waste management consultant Yasuo Onishi is being photographed against the enormous new nuclear reactor sarcophagus that is constructed in the Chernobyl zone. He seems to be very proud. And one should say that he has all the reasons for that. A hostel has recently opened in the midst of the Chernobyl exclusion zone that is located in Ukraine. This zone is the area that was contaminated as a result of the Chernobyl NPP accident that had happened in 1986. It covers about 2,600 square kilometers. One should note that it is acknowledged to be highly dangerous. 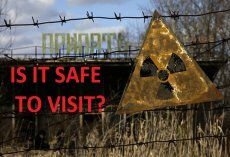 More than 30 years had passed since the day of the most powerful nuclear accident in history but the 30km zone of alienation remains uninhabitable due to strong radioactive pollution of the soil, water, and vegetation.